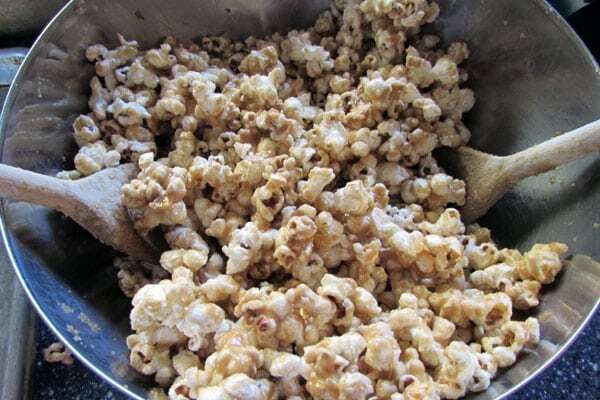 You can make caramel corn without using corn syrup! This easy recipe comes together in no time, using ingredients you already have in your kitchen. We are serious caramel corn fanatics around here. Hubby and I love caramel corn, but I don’t love all the weird ingredients you get when you buy it from the store. I thought I would make it at home, but every recipe I found used corn syrup…yuck. 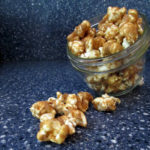 With a little bit of experimentation, I was able to put together a delicious recipe for caramel corn without corn syrup. You can even add peanuts to it and make your own Cracker Jacks! I made caramel on the stove top and poured it over the popcorn. It was too gooey. I made the caramel with honey and baked it in the oven. It was too burnt. Then I made the caramel with brown sugar, baked it in the oven, and it was JUST RIGHT. Don’t use microwave popcorn! Use an air popper or a WhirleyPop. Put the popcorn in a large bowl and preheat the oven to 250F. In a large saucepan, melt the butter and mix in the sugar, stirring until the sugar is dissolved. Increase heat to medium-high and boil the mixture for 3-4 minutes, stirring constantly. It will change from grainy to smooth and then will begin to thicken and look like…well…caramel! Remove the saucepan from the heat and add the vanilla, salt, and baking soda. 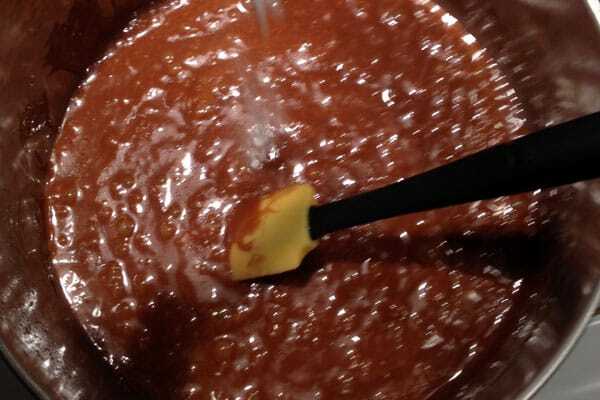 The caramel will foam up when you add the baking soda, which is why you want to use a big saucepan. Carefully pour the hot caramel over the popcorn (grab a friend to help) and stir gently to combine. Add the peanuts here if you’re making Cracker Jacks. 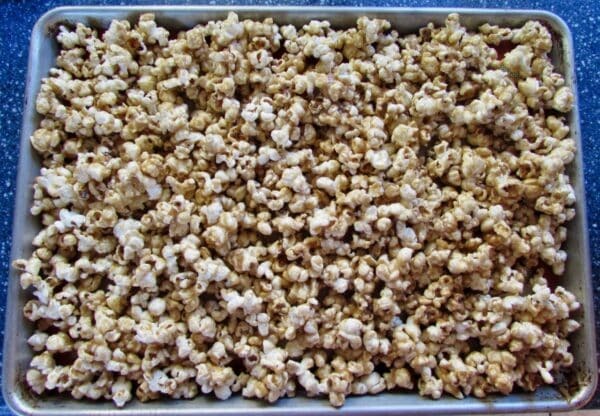 Pour the caramel corn onto two cookie sheets lined with parchment paper or Silpat. Bake at 250F for one hour, stirring every 15 minutes. Allow to cool and munch, munch, munch! 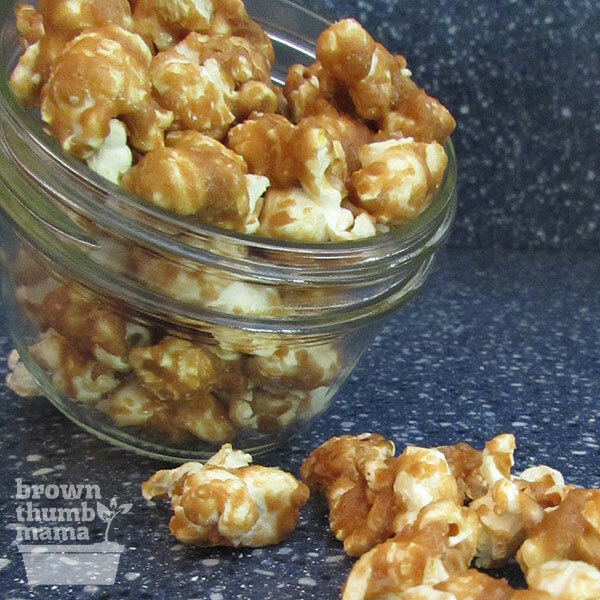 You can make caramel corn without using corn syrup! This easy recipe comes together in no time, with ingredients you already have in your kitchen. Note: Don’t leave the stove while the caramel is boiling. 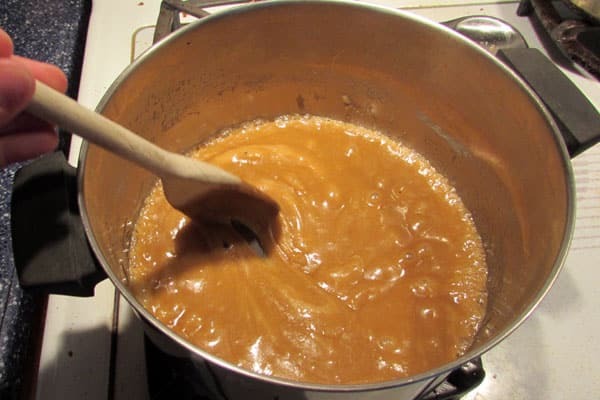 It takes about .05 seconds for the mixture to overcook and turn brown instead of caramel-colored. Carefully pour the hot caramel over the popcorn (grab a friend to help) and stir gently to combine. Yes, you could add some peanuts at this point and make Cracker Jack, but why mess with a good thing? I like to eat the caramel corn by itself. Do you think DIY brown sugar would work? I tried it once and it separated, never bubbled up. so I dumped it and tried again same result. I am on my way to store to get some karo syrup. I don’t follow many blogs and read even fewer but I have to say that I read and enjoy all that you post & share. You are crafty & creative in so many aspects and I really like your healthy/ alternative takes on recepies. I started following when I say that awesome wreath you made and have stuck around because your great!!! Just wanted to let you know. 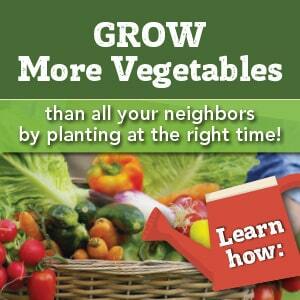 Sounds delich and pretty simple! Thanks for your trials and errors. This sounds delicious! Safety tip: when working with caramel, have a bowl of ice and water nearby. If you goof and get caramel on your hand, plunge it right into the bowl and your burn will not be nearly as bad. I have actually never made caramel corn but now that you have written about and spent all that trial and error I will definitely be making some for our Family Night. Thanks for this recipe. I prefer your version, and I plan to make a batch this weekend. I love making home made treats for my brothers, niece and nephews for Christmas. This is definitely going to be in there bag of goodies this year! Thanks for sharing. Totally did not work for me. Not sure what I did wrong. This was like your graham cracker fail, lol! Didn’t work for me either 🙁 Caramel separated after I added the dry ingredients.. I just made It and it turned out awesome! Even my husband, who doesn’t like popcorn, loves it! Thank you for the recipe! I tried this 3 times and it never turned out right, and I’ve made caramel many times before. Something always went wrong at the point when I added the vanilla, salt & baking soda. Maybe the mixture was still too hot? So frustrating!! This was amazingly good! We could not stop eating it! Thanks so much! This recipe is garbage. Caramel does not come together at all. Thanks for the brown sugar crusted popcorn. What a waste of resources. So delicious. However, my spatula melted! Recipe is great!! Hubby and I both love it! For some reason the mixture started separating after i took it off the heat and then once it was on the popcorn the sugar was grainy again. Not sure what happened. Maybe it didn’t get hot enough or it got too cool before getting onto the popcorn. I also didn’t realize it was going to take so long, I was looking for something quick but didn’t read all the way through the recipe…I just knew I didn’t have corn syrup. Any tips on perfecting the caramel? Mine separated after adding the vanilla, baking soda and salt..
Corn syrup, i.e. Karo, is NOT the same as high-fructose corn syrup. And you’ve never made a pecan pie? Mine did not ever get like caramel. It just remained grainy. Followed instructions. Will not make again. Made a mistake in measuring. Disregard review. Sounds delicious! I’m curious, is the baking just to make it harder? Could I not bake and it to keep it gooey and would it still taste okay? Yes, the baking makes it crispy like Cracker Jacks. Otherwise, it gets gooey and sticky. assuming i can get this to come out right….how long would it last if i made it for gifts?? I dont want to do it too early and have it get stale. I found this recipe and really like it. I have made for me and my girls about 3 times now. We really like it. I did have to make an adjustment to it. I added another 1/2 stick of butter and 1/2 cup of chopped pecans. It still turned out great. We will be having a great snack for a couple of days. We love it. Great recipe! Tastes so good! Not grainy at all. I did up the butter to 2 sticks and added a little under 1/4 cup more brown sugar. I also used a whisk like a previous commenter suggested and used a wooden spoon to mix the caramel with the popcorn. Yum! I’ve cooked the caramel for the full 4 minutes and it seems like it’s okay but the finished product at the end of baking is grainey. 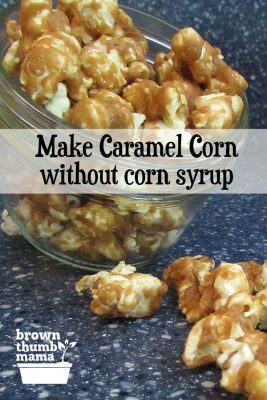 I made caramel corn 6 times last year with a corn syrup recipe and didn’t have this issue. Any help? Try cooking at medium to start. I also needed to add a splash of milk after the dry ingredients because it was not pourable. I used half and half because that’s what I had. Did not want to use Almond milk.